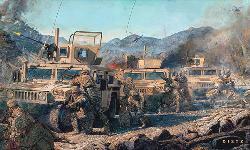 By Force and Valor In February 2009, 1st Squadron, 40th Cavalry Regiment (Airborne) deployed to Afghanistan in support of Operation Enduring Freedom. 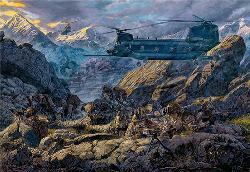 The Squadron found itself at 8,000 feet in Paktya Province in the vicious Pashtun tribal region bordering Pakistan. 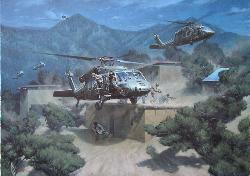 The Squadron immediately began conducting counter insurgency operations across an area the size of Delaware. As winter turned to spring the enemy mustered his forces and met the Squadron head on. The brave scouts of 1-40 CAV were tested from the mountainous and violent Khost-Gardez Highway to the populated and Taliban infested valley of Zormat to the lethal and distant Jaji Ayrub region along the Pakistan border. 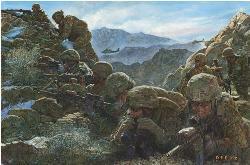 Afghan and Cavalry Paratroopers were faced with a determined enemy and beat them back at every turn thanks to outstanding junior leadership and individual bravery. In places named Zormat, Jaji, Gerda Serai and Shewak, Cavalry Paratroopers answered the call, standing side-by-side with Afghan National Security Forces in an effort to protect an innocent population from forces that would deny them basic human rights. In July, the Squadron was called upon to move to another area of operations in Paktika Province and take charge of a makeshift task force, affectionately known as “Denalimo”, in support of DUSTWUN operations. 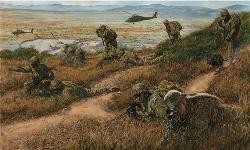 This task force conducted 14 air assault missions in just ten days, as well as a multitude of other operations during the month of July, while trying to recover one of the Brigade’’s own. 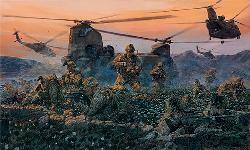 As the violent summer wore on, the Squadron continued to take the fight to the enemy, conducting multiple large-scale air assaults, vehicular, and dismounted operations across Paktya. 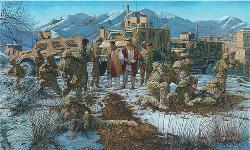 The unit’’s last test came near the end of their time in Afghanistan. 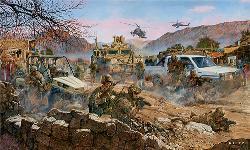 The Squadron was ordered to pack up and take over yet another battle space; this time in the violent Khost “bowl” region. 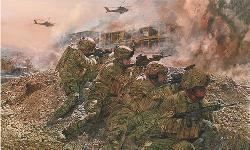 This mission would prove to be the most challenging yet for the tired paratroopers. With the new battle space came the job to partner with and mentor the 1st Brigade, 203rd Corps (Afghan National Army), which owned battle space across Paktya and Khost Provinces. 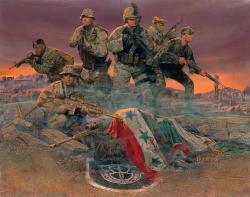 What they accomplished in their last three months in theater, was unprecedented in the history of OEF. Through their hard work and dedication, the Squadron set the stage for the next unit by partnering down to the paratrooper level, emplacing systems, and training the Afghan Army on counter-insurgency operations. 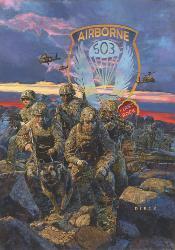 In February 2010, the Squadron returned home to Fort Richardson, Alaska and began to prepare for the next mission. 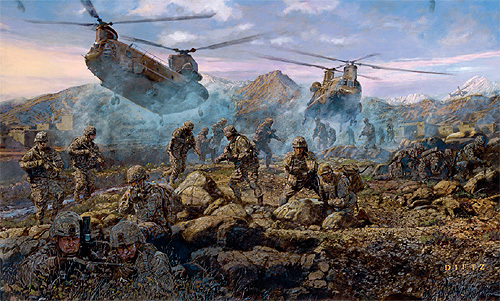 The accompanying print depicts the following: Task Force 1-40 Cavalry (Airborne) conducts another Air Assault in Paktya Province, Afghanistan as part of Operation Enduring Freedom. 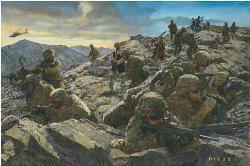 Paratroopers from the Denali Squadron penetrate Taliban territory to begin a comprehensive counter-insurgency effort of separating the enemy from the populace and achieving effects with the population. By Force and Valor! 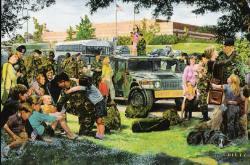 Image Size: 31" x 21.5" Overall Size: 25" x 15"